The exceptionally gifted oral surgeons of Advanced Periodontics & Implant Dentistry have helped thousands of patients achieve attractive, confident smiles through the dental implant treatment. Explore this page to learn how Dr. Wayne Aldredge, Dr. Richard Nejat and Dr. Daniel Nejat perform this procedure to achieve stunning results. If you would like to find out whether you are a dental implant candidate, please schedule a personal consultation by calling us today, or clicking here to request a free consultation. The dental implant replaces the natural tooth root with a dental implant that is inserted into the bone. 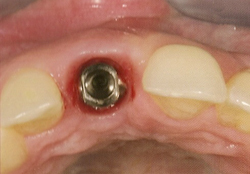 An abutment is secured to the implant, and a crown is secured to the abutment. 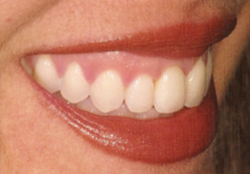 The dental implant option closely mimics the design and function of your natural tooth. The dental implant is the most secure option for replacing a single tooth, with a solid foundation of bone that keeps it stable, withstanding the forces of biting and chewing. 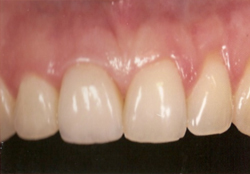 An implant feels and functions like a natural tooth, and it is proven to outlast all other tooth replacement options. Another huge advantage of choosing a dental implant to replace a single tooth is that the adjacent teeth will not be adversely affected, as they would be in other treatments. Choosing a dental implant removes the need to grind down adjacent teeth as you would to place a bridge. Occasionally, this grinding process can lead to the need for further treatment such as root canal therapy on these prepared teeth. 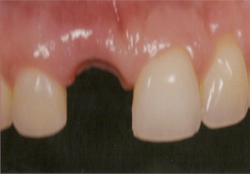 Bridges that are not kept clean can result in decay under the bridge and result in further tooth loss. 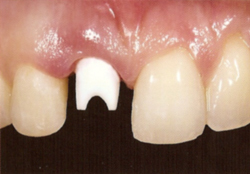 Dental implants can not get decay, making them an ideal long-term treatment option. The highly skilled dentists of Advanced Periodontics & Implant Dentistry have many years’ experience performing sophisticated dental implants procedures. In addition, they are experienced, board-certified periodontists. In fact, all of the dentists of Advanced Periodontics & Implant Dentistry have been recognized by their patients and peers as ranking among the top periodontists New York / New Jersey is home to.